The find dialogue is a nondescript but fairly essential tool of any sequence analysis application. With uses such as finding short sections in your sequence to quickly searching for a primer it is probably one of the most commonly used tools. The Find dialogue in MacVector is a powerful tool but this power comes at a price as the dialogue has never been that easy to use. In earlier versions the array of options could really daunt the new user. However, many long time users really like the way it works and so a complete redesign would have risked upsetting some users. Over that past few releases we have been gradually tweaking this dialogue to make it easier to use, but without removing any of the flexibility. We’ve also been adding new functionality as we added the ability to search in Features and in results pages back in MacVector 10.5. With MacVector 12 we have removed the REVERSE and the COMPLEMENT options. All these options did was to reverse or complement the query. If you searched the forward strand and used both options in reality you were searching the reverse strand albeit in a 3′ to 5′ direction. Although it was technically possible to search with just the reverse of a sequence or just the complement of a sequence, rather than the reverse complement we could not think of a single real world use of this function. Furthermore these two options have confused many users in the past. So we removed these and changed the default to search both strands. So now any real matches will still be found without these two options and without having to enter the reverse complement of your query sequence. 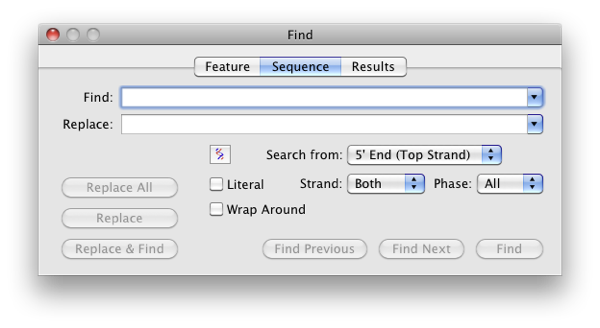 We’ve also enhanced circular sequence searching. In MacVector 12 there has been extensive work on algorithms so that they can analyse features that cross the origin. This includes the Find dialogue which will now match any queries that cross the origin. Furthermore there is a new WRAPAROUND option. With the default options when you click FIND the algorithm looks from the 5′ end of the forward sequence (and 3′ end of the reverse sequence now) until it find the first match. Then if you click FIND NEXT it will look for the subsequent match and so on until it reaches the end of the sequence, although now as long as a match starts before the end of the sequence and extends across the origin it will still be found. 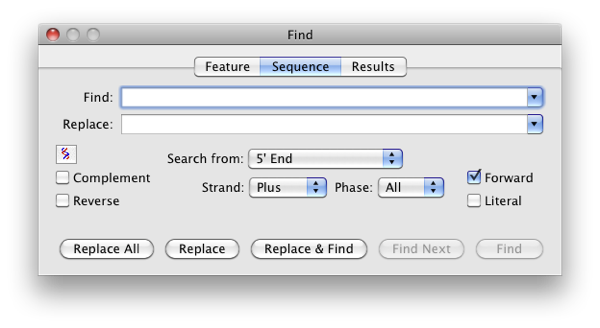 However, with the WRAPAROUND option selected FIND NEXT will continue indefinitely around the sequence. The FORWARD button has also gone being fairly redundant. Hopefully we’ve made it just that bit easier to use! But if you disagree please do let us know! MacVector 12 is now officially released. This entry was posted in Releases, Tips and tagged releases. Bookmark the permalink. Both comments and trackbacks are currently closed.